I recall interviewing Tony Visconti many years ago, when he was still operating Good Earth Studios in Soho, and he explained to me the setup of gates and room mics that this plug-in emulates. We were discussing the vocal treatment he used on the David Bowie track ‘Heroes’, from the album of the same name. At the time, it was a very inventive way of working around the limitation of having only one tape track left for the vocal. It was also quite brave, as the gate settings that are a key part of his original setup are crucial, and a wrong setting could have ruined an otherwise perfect take. Tony set up three microphones in the hall of Berlin’s Hansa Studios: one conventional close mic and the other two at different distances back in the hall, where they would pick up a lot of the hall’s natural reverb. Gates on the second and third microphones were set to open at progressively higher thresholds, so the quietest vocal passages would see only the close mic go to tape, while the loudest would see a blend of all three recorded. Eventide’s take on the idea requires a bit less commitment from the engineer! T-Verb incorporates three completely independent reverbs plus compression and selectable polar patterns on the close vocal mic. The gates on microphones two and three are fully adjustable, with meters for level and gain reduction as well as gain, threshold, attack, release and hold controls. While it is possible to emulate the original ‘Heroes’ treatment (which is included as a preset), T-Verb would be a bit of a one-trick pony if that was all it could do. In fact, the plug-in goes rather further than the original: the room mics are stereo and the mic positions can actually be automated along with the other parameters, to make it sound as though they are being moved around the room. 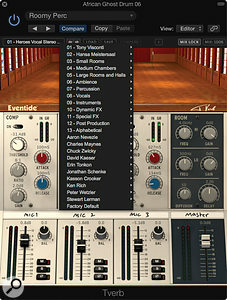 T-Verb features numerous ‘celebrity’ presets, including some from Tony Visconti himself. 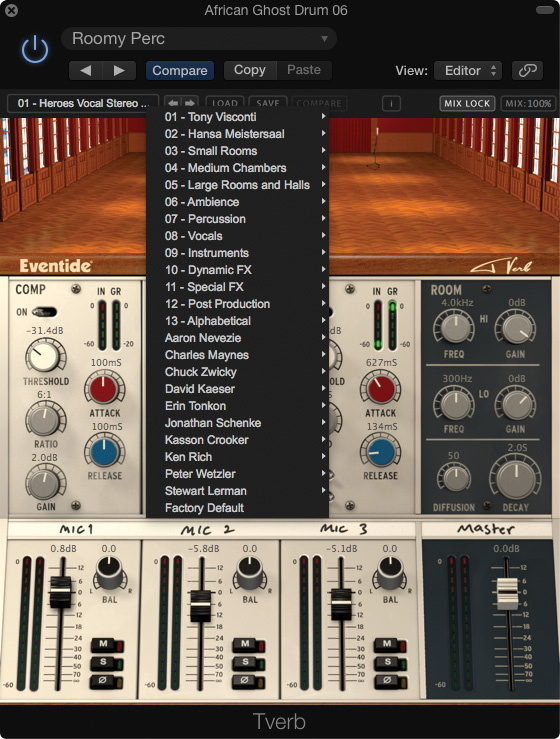 We’re not told exactly how the reverb is generated, but the emulation of Hansa’s Studio 2, the Meistersaal concert hall, sounds extremely believable, and Eventide have managed this without imposing too much of a CPU load. The two far microphones can be placed anywhere in the hall, and the overall room reverb can be adjusted for EQ, diffusion and decay from the master Room section. The two gates come post-reverb, with console-style faders controlling levels and stereo placement. There are also solo, mute and polarity buttons to optimise or exploit the phase relationships between the three mics. Most of the settings are self-evident, though the near mic settings only appear when you hover the cursor over the mic graphic. This gives the option of engaging separate high- and low-cut filters and switching between omni, cardioid and figure-of-eight polar patterns. As you’d expect, a number of presets have been included, and a useful Mix Lock feature allows the user to audition them while keeping the wet/dry mix constant. As the basic reverbs are so good, the plug-in could simply be used to produce a hall or chamber ambience, and it will do so very well, with plenty of variation to be had just by moving the mics and tweaking the decay and density controls. However, those gates can be used in a number of ways to make the processing more interesting. As the gates have separate Hold controls, they can be used to set up very convincing gated-reverb treatments, which sound rather more authentic than the faked ER bursts so often used in place of gated reverb. Then there are variations on Tony Visconti’s original setup to produce reverbs that come into play only when the input is loud enough. The wealth of presets, created by Tony himself and by a number of guest producer/engineers, really shows off the scope of this plug-in, which I found worked particularly well on drums and percussion, though it can be applied to pretty much any instrument or voice. When I first heard about this plug-in I wasn’t sure quite what to expect, as doing the ‘Heroes’ thing is obviously a bit specialised, but having tried a number of different instruments and settings, I’m really starting to appreciate what T-Verb can do — and it’s a lot. You can get a free demo, so give it a spin. I think you’ll like it.